New ringers are always welcome. Have YOU ever thought you might like to become a bell ringer? We are urgently seeking new recruits who would like to learn how to ring bells. Just turn up at a Thursday practice and introduce yourself! Sidbury tower has eight bells, the earliest dating from 1662 and 1663. Six more were hung in 1712, 1750, 1752, 1776 and two in 1947 to complete the present eight. The Captain of Bellringers is Andrew Clarke and Sidbury has a small band of enthusiastic ringers, usually enough to ring five or six of the bells at Sunday services and weddings. 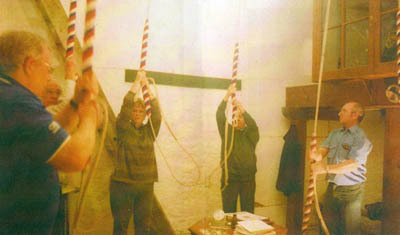 Bell ringing practice is on Thursdays at 7.00 pm, except for the second Thursday in any month when The East Devon Guild of Ringers use the tower.